Demo: 2 hour evaluation available here. As you are probably aware, over the past few years there has been an increasing trend in industrial controls and automation to move the communication from proprietary drivers to standards based OPC server technology. There are various reasons for this, but the most important factors are data interoperability between the control systems and the enterprise not to mention the decreased infrastructure costs that come from being able to standardize on the infrastructure elements. KEPServerEX is a 32 bit server application from Kepware, and is the most widely OEMed product in the automation industry. You can use this server instead of traditional old-style proprietary drivers for bringing data and information from a wide range of industrial devices and systems into client applications on your Windows PC. KEPServerX is built using the latest OPC standards from the OPC Foundation and is a very good choice for anyone looking to expose their plant and manufacturing data to other PC applications. 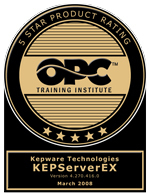 The KEPServerEX is also a great choice for those who are using existing OPC drivers but find they are limited in what they can do with them, for example, sharing data with 3rd party applications.